Order now and receive free freight! Every CONFAST® Carbide SDS Max Bit is in stock for immediate shipping. SDS-Max bits are carbide-tipped bits used for drilling holes in concrete, brick or block base material. The tip of the bit is made out of carbide. The SDS-Max carbide-tipped bits are used in large electro-pneumatic hammer drills. The SDS-Max bits are attached to the electro-pneumatic hammer drill via a keyless chuck. Our SDS-Max bits are American made from premium quality steel and carbide. The SDS-Max bits are available in diameters from 3/8" to 1-1/2" and lengths up to 48". •	The SDS-Max concrete bit has a carbide tip and is used for drilling holes in concrete. 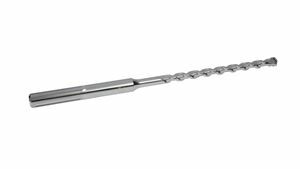 •	The shorter bits, such as the 3/8” x 13” SDS-Max concrete bit, are primarily used to drill holes for the installation of concrete fasteners. •	The longer SDS-Max concrete bits are used to drill through holes for running electrical conduit or other type of pipes. •	The SDS-Max concrete bit is designed specifically for larger hammer drills that use the quick disconnect chuck that accepts the SDS-Max style shank. •	Many of the large Hilti combi hammer drills utilize the SDS-Max style for the shanks of their drill bits. •	The shank of the SDS-Max concrete bit is approximately 3/4” in diameter, which is much larger than the smaller SDS bits that are approximately 3/8” in diameter. •	The SDS-Max concrete bits have groove cut into the shank that allows the bit to move in the chuck to provide extra strength for rotation. •	The grooves allow for a more powerful hammering and rotation motion, which results in faster drilling speed and efficient dust removal. •	Special fluting of the SDS-Max concrete bit provides for increased dust removal, which permits faster drill speed. •	Ranging in diameters from 3/8” to 2” and in lengths from 13” to 36”, there is a SDS-Max concrete bit available to meet a wide range of drilling requirements. •	The designated length of the SDS-Max concrete bit is an overall length measured from end to end. •	The drilling depth is 6” to 7” less than the overall length, and is measured as flute length of the shank of the SDS-Max concrete bit.